I spent some time in Southern California when I was a kid. 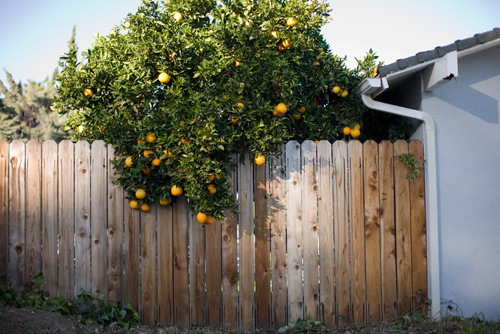 When we moved to Orange County, our Woodbridge neighborhood was still bordered by miles of orange groves. I found this picture (which is actually taken in Santa Barbara) on an “affordable art” website but it immediately reminded me of those days in the late 80’s, when we would head down Irvine Center Drive. Along one side of the road stood tall and straight rows of Eucalyptus trees with varying degrees of peeling bark and on the other, stout little trees full with orange fruit. The smell was fresh and amazing and I can still recall it to this day, every time I pull back the skin of a fresh orange. Now, there is nothing but a sea of little pink condos and homes up for short sale and the booming Irvine Spectrum. Maybe that’s why I was so drawn to this photo… it reminds me of a place, I used to call home, that just doesn’t exist anymore.